In a move to bolster adoption of dApps on its network, Tron has launched its new Tron Virtual Machine, as well as a suite of smart contract development tools, to meet evolving developer needs. What Will the TVM Entail? While a large sum of decentralized applications (dApps) are using the Ethereum Virtual Machine (EVM) as their platform of choice, developer feedback has revealed that platforms like Ethereum are no longer able to meet expected needs, according to Tron Foundation. However, in a move to further blockchain technology adoption, and as a response to growing developer desires, Tron has launched its new Tron Virtual Machine. For the uninitiated, a virtual machine is a tool that allows developers to write programs, known as “smart contracts,” that run on every Tron network node. By utilizing these smart contracts on a VM, developers can build their own dApps. TVM will also enable the Tron network to appeal to a variety of applications and industries–including gaming, social networking, content distribution and finance–as well as offer more options to the network’s holders. Furthermore, the TVM will showcase a score of features including optimized compilers to enhance overall performance; a high-speed of 2,000 transactions per second and three-second block times; the ability to implement freezing, voting and trading in smart contract code; a new resource manager; a new database to support blockchain uses; the computer-programming language Java, allowing developers who built non-blockchain applications to integrate blockchain technology using the Tron network; and more. The TVM is now available, along with a suite of smart contract development tools. In the near future, Tron plans to provide support to additional virtual machines, such as EOS VM. 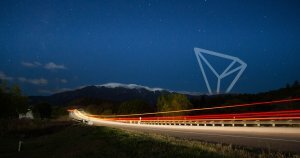 Most recently, Tron launched the dApp TronChat to democratize social media monetization, as previously reported by CryptoSlate. Additionally, the Tron community elected BitTorrent as one of 27 super representatives on the network. A Tron super representative acts a key node on the Tron protocol and is capable of validating transactions, creating new blocks and competing for block rewards.